Ciena’s annual Vectors event in Ottawa never disappoints when it comes to fresh ideas, collaboration, and the all around great time that happens when you get some of the best and brightest network engineers and thinkers in the same room together. That includes our Research & Education (R&E) partners, many of whom made the trip to Ottawa so we could discuss their needs and the technologies that can help solve them as a collaborative team. A highlight of this year’s Vectors event was a 300G 8QAM trial conducted over a live research network connecting our Ottawa lab to StarLight’s Chicago-based R&E communication service exchange at a distance of 1,440km. Intrigued? Keep reading. Rod Wilson is Ciena’s Senior Director for External Research, with responsibility for Ciena’s global interaction and collaboration with universities and government research organizations, including Ciena’s participation with Research and Education networks such as CANARIE (Canada) and StarLight (USA). 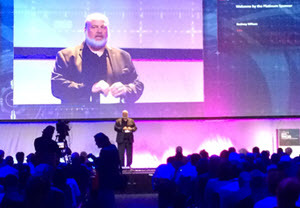 Rod was also an opening plenary speaker at this week's TNC16 conference in Prague. Ciena’s annual Vectors event in Ottawa never disappoints when it comes to fresh ideas, collaboration, and the all around great time that happens when you get some of the best and brightest network engineers and thinkers in the same room together. That includes our Research & Education (R&E) customers – or partners as I prefer to think of them – many of whom made the trip to Ottawa so we could discuss their needs and the technologies that can help solve them as a collaborative team. Vectors, being an extension of the ongoing work in our R&D labs, is a playground for cool tech. This year’s event included more than 20 product and technology demos – reflecting our full portfolio of next-generation optics, packet networking, next-generation network management and planning, and multi-domain service orchestration. A highlight of this collection of demos was a 300G 8QAM trial conducted over a live research network connecting our Ottawa lab to StarLight’s Chicago-based R&E communication service exchange at a distance of 1,440km. The link between Ciena’s Ottawa R&D labs and Chicago is part of an international collaborative testbed used to advance development of computer communications technologies. The demo, conducted with CANARIE and StarLight, used Ciena’s Waveserver platform and our WaveLogic 3 Extreme chipset to send a 300G superchannel (two 150G wavelengths) using an 8QAM (quadrature amplitude modulation) format. The 1,440 span is a bit of a sweet spot for 8QAM – a bit too far for 200G 16QAM in most cases but faster than 100G formats like QPSK that are used for long haul and ultra long haul distances (see modulation chart at right). This mix of coherent modulation formats provides a critical benefit in that it allows the flexibility to create the biggest pipe possible for the task at hand, be that metro data center interconnect (DCI) or trans-continental data exchange. And for the R&E community this is no small matter. CANARIE is seeing annual data growth of 50% per year – transmitting an astounding 172 Petabytes of data last year alone. The Waveserver 8QAM Vectors demo also served as a real-world field trial. While Ciena has extensive and complex network simulation capabilities in it’s Ottawa R&D facilities, we can often discover things in real-world deployments that are difficult to simulate in our Labs. Setting up this Vectors demo was extremely useful in this regard and our developers were able to extract performance data from the Waveservers that we could not have otherwise obtained. Some R&E network operators like CANARIE and StarLight are willing to take risks and encourage first-of, prototype and “pre-commercial” deployments on their networks, but this is not for the feint of heart as their feedback is brutally honest and blunt. In this case, Waveserver 8QAM exceeded expectations and Ciena received high marks for our deployment of 8QAM 300G over a distance exceeding 1,400km. In addition to the Waveserver 8QAM Vectors demo, this 300G facility (upgraded from previous 100G, on a system originally designed for 10G) between our Ottawa labs and StarLight was used for other Vectors demos. One demo connected Vectors to Ciena servers located in Amsterdam and was used to show Ciena’s advances in cybersecurity defence techniques. Other Vectors demos used the link as part of a series of demonstrations concerning Blue Planet Network Analytics. Ciena greatly appreciates the generous collaboration with CANARIE, Starlight and other R&E network operators who contributed to this year’s Vectors resounding success. While the event was based in Ottawa, deploying brand new Waveserver 8QAM 300G on a live customer network at record making distances requires trust, and no shortage of technical prowess.